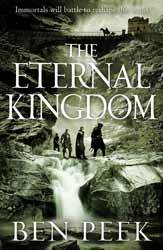 It is not often that I find myself internally polarised by a novel, usually they follow an understandable structure and especially a trilogy they tend to behave like any other form of three act narrative, not so The Eternal Kingdom (2017. 673 pages), written by Ben Peek. I’ll put my hand up and admit not to have read the first two books in the trilogy, The Godless and Leviathan’s Blood, as a reviewer this is not necessarily unusual and most writers are adapt at succinctly providing enough information for the casual reader to get up to speed. Kingdom does come with a preamble précis of the story so far, usefully highlighting the three main strands of the story and the main protagonists. It is dense and not that easy to absorb, for reasons which I shall explain. On the good side I did like the world that Peek created. The story is set in a universe where gods had previously existed. Having gone to war with one another they disappeared thousands of years ago, but they left behind their servants who, being god touched, inherited extraordinary powers as well as longevity and in some cases were impossible to kill. Things changed when a new god was born. ‘Se’Saera’, whose birth splits the loyalties of the immortals with some welcoming the advent of a new god and other wary of all she represents, viewing her birth as more of an abomination. Feelings and opinions are likewise split amongst the short lived humans. When this novel commences the two sides are marshalling their power for a direct confrontation. The first issue that a novice reader will discover is the almost total inability to place any of the characters within this world. The book does have a map, but this only details the main kingdoms and continents. The lack of places names mean that even if you refer back to the map, you never really understand where the action is taking place or where the main players are in relation to each other. The second issue I had was that I found it difficult to keep in mind just who each character was. Some - like Aned Heast, a mercenary and Captain of the Refuge, a sort of sell sword army with a conscience - are written in a very clear manner and his story was the easiest to follow. The same can be said of Zaifyr, an immortal, who was imprisoned by his fellow immortals, although he shares another issue with names in that he has two Zaifyr/Qian which are interchangeable and the logic of the chose was often obscure. This is not the only character with this duality of nomenclature. Lastly the author has chosen to offer names for characters which are often too similar, Aela Ren, Aelyn Meah, Ayae, being the worst example. Throw in the narrative which skips back and forth in time and then branches into possible futures and I’m afraid that this book took me so long to read that it became a chore. I have no problem with complexity, but Kingdom seemed to be creating complexity for complexities sake; obfuscating the interesting and solid backbone of the created world. The book does not even fulfil the role of the third book. You certainly get the final showdown, but the majority of the narrative has the characters moving around without a point of reference for the reader and spending their time navel gazing offering up to the reader information which would have felt more at home in a second novel. I literally looked up at page 370 to come to the realisation that almost nothing had happened and it pretty much remained that way for the bulk of the book. There were some secondary subplots which probably could have been dropped if the book was going to have any pace. So, this is where I feel conflicted, I’m guessing that if you had read the first two books this may be the continuation of a rich and unfolding tapestry. But the book's structure, moving backwards and forwards in time as well as across possible futures, meant that the rest of the narrative had to have a crystal clarity and this is its main fault - that as a reader the book lacked focus to the point of being ultimately unnecessarily obscure.